When you think of blood, chances are you think of the color red. But blood actually comes in a variety of colors, including red, blue, green, and purple. This rainbow of colors can be traced to the protein molecules that carry oxygen in the blood. Different proteins produce different colors. Many researchers who search for anti-cancer drugs have labs filled with chemicals and tissue samples. Not Rommie Amaro . 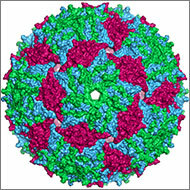 Her work uses computers to analyze the shape and behavior of a protein called p53. Defective versions of p53 are associated with more human cancers than any other malfunctioning protein. Imagine if scientists could zap a single cell (or group of cells) with a pulse of light that makes the cell move, or even turns on or off the cell’s vital functions. Scientists are working toward this goal using a technology called optogenetics. This tool draws on the power of light-sensitive molecules, called opsins and cryptochromes, which are naturally occurring molecules found in the cell membranes of a wide variety of species, from microscopic bacteria and algae to plants and humans. These light-reacting molecules change their shape or activity when they sense light, so they can be used to trigger cellular activity, such as turning on or off ion flow into the cell and other regulatory pathways. The ability to induce changes in cells has a broad range of practical applications, from enabling scientists to see how cells function to providing the basis for potential therapeutic applications for blindness, cancer, and epilepsy. Opsins first gained a foothold in research about a decade ago when scientists began using them to study specific electrical networks in the brain. This research relied on channelrhodopsins, opsins that could be used to control the flow of charged ions into and out of the cell. Normally, when a neuron reaches a certain ion concentration, it is triggered to fire, but neuron firing can be changed by inserting opsins in the membrane. Neuroscientists figured out how to incorporate light-sensitive opsin proteins by inserting the opsin gene into the host’s DNA. The genetically encoded opsin proteins in the neuronal membranes could be turned on or off by shining light into the brain itself, using optical fibers or micro-LEDs, to switch on or off the flow of ions and neuron firing. Since those early studies in the brain, the optogenetics field has come a long way. But the leap from brain cells to other cells has been challenging. Scientists first needed to find a way to deliver light into tissues deep in the body. And, unlike stationary brain cells, they needed a way to target cells that are on the move (such as immune cells). They also needed to develop a way to study not only cell networks but also individual cells and cell parts. The NIGMS-funded researchers highlighted below are among the scientists working to overcome these obstacles and are using optogenetics in new and inventive ways. Illustration shows how “bridges” can be built within a cell through the use of light-reacting molecules. The light triggers proteins to line up within the cell, making it easier to shuttle molecules between the membranes of two subcellular organelles. This optogenetic strategy is helping scientists to control cell function with a simple beam of light. Illustration courtesy of Yubin Zhou. Yubin Zhou of Texas A&M is using optogenetics to control the way cells communicate and to study immune cell function. In one line of research, Zhou is using light to make it easier for calcium ions to enter cells. The ions carry instructions for the cell and also help tether small cellular structures (called organelles). Those inter-membrane tethers allow for the movement of proteins and lipids back and forth across the cell, and are critical for sending chemical messengers to communicate information (see illustration). When this process is disrupted, it can lead to extreme changes in cell function and even cell death. Using this technology to “switch on” normal pathways enables the scientists to better understand how such processes can be disrupted. It’s back-to-school time. That means learning lots of new facts and figures. In science, terms tend to be several syllables, sometimes with a Latin word thrown into the mix. As a result, many are referred to by their acronyms, such as DNA—short for deoxyribonucleic acid. This makes them easier both to remember and to say. Researcher Mark Howarth of Oxford University, has taken this a step further. Searching through information stored in the NIGMS-funded Protein Data Bank , he curated a 3-D protein alphabet. It’s a set of 26 protein crystal structures that look like they were fashioned from bits of rainbow-colored curly ribbon. This 3-D alphabet helps us see what different protein strands look like, and explains terms and concepts relating to protein structure and function. Like a successful business networker, a cell’s endoplasmic reticulum (ER) is the structure that reaches out—quite literally—to form connections with many different parts of a cell. In several important ways, the ER enables those other parts, or organelles, to do their jobs. Exciting new images of this key member of the cellular workforce may clarify how it performs its roles. Such knowledge will also help studies of motor neuron and other disorders, such as amyotrophic lateral sclerosis (ALS), that are associated with abnormalities in ER functioning. An illustration of some of the jobs that the endoplasmic reticulum (ER) performs in the cell. Some ER membranes (purple) host ribosomes on their surface. Other ER membranes (blue) extending into the cytoplasm are the site of lipid synthesis and protein folding. The ER passes on newly created lipids and proteins to the Golgi apparatus (green), which packages them into vesicles for distribution throughout the cell. Credit: Judith Stoffer. The ER is a continuous membrane that extends like a net from the envelope of the nucleus outward to the cell membrane. Tiny RNA- and protein-laden particles called ribosomes sit on its surface in some places, translating genetic code from the nucleus into amino acid chains. The chains then get folded inside the ER into their three-dimensional protein structures and delivered to the ER membrane or to other organelles to start their work. The ER is also the site where lipids—essential elements of the membranes within and surrounding a cell—are made. The ER interacts with the cytoskeleton—a network of protein fibers that gives the cell its shape—when a cell divides, moves or changes shape. Further, the ER stores calcium ions in cells, which are vital for signaling and other work. Skin cancer cells from a mouse. Credit: Catherine and James Galbraith, Oregon Health and Science University, Center for Spatial Systems Biomedicine, Knight Cancer Institute. This heart-shaped image shows two mouse skin cancer cells connected to each other with actin, a protein that is part of the cellular skeleton. Researchers use mouse cells like these to tease out the molecular methods that cancer uses to invade new tissues in the body. It turns out that actin plays an essential role. In the 13 years since the sequencing of the human genome, the list of “omes” has proliferated. Drop us a comment with your favorite ome—we may feature it in a follow-up post next month. Have you ever collected coins, cards, toy trains, stuffed animals? Did you feel the need to complete the set? If so, then you may be a completist. A completist will go to great lengths to acquire a complete set of something. Scientists can also be completists who are inspired to identify and catalog every object in a particular field to further our understanding of it. For example, a comprehensive parts list of the human body—and of other organisms that are important in biomedical research—could aid in the development of novel treatments for diseases in the same way that a parts list for a car enables auto mechanics to build or repair a vehicle. Below are three -omes that NIH-funded scientists work with to understand human health. 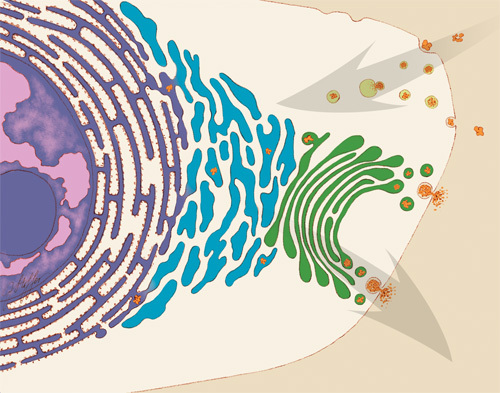 Illustration of the entire outer shell of the bacteriophage MS2. Credit: Wikimedia Commons, Naranson. The genome is the original -ome. In 1976, Belgium scientists identified all 3,569 DNA bases—the As, Cs, Gs and Ts that make up DNA’s code—in the genes of bacteriophage MS2, immortalizing this bacteria-infecting virus as possessing the first fully sequenced genome. Newly Identified Cell Wall Construction Workers: A Novel Antibiotic Target? A family of proteins abbreviated SEDS (bright, pink) help build bacterial cell walls, so they are a potential target for new antibiotic drugs. Credit: Rudner lab, Harvard Medical School. Scientists have identified a new family of proteins that, like the targets of penicillin, help bacteria build their cell walls. 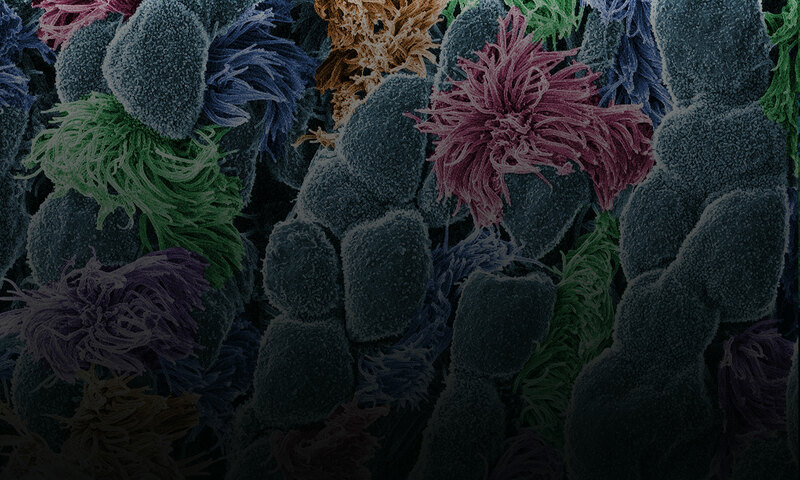 The finding might reveal a new strategy for treating a range of bacterial diseases. The protein family is nicknamed SEDS, because its members help control the shape, elongation, division and spore formation of bacterial cells. 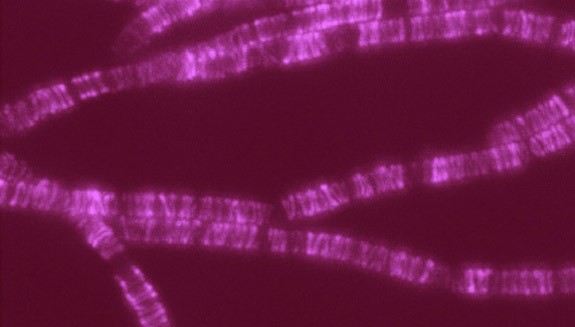 Now researchers have proof that SEDS proteins also play a role in constructing cell walls. This image shows the movement of a molecular machine that contains a SEDS protein as it constructs hoops of bacterial cell wall material. Any molecule involved in building or maintaining cell walls is of immediate interest as a possible target for antibiotic drugs. That’s because animals, including humans, don’t have cell walls—we have cell membranes instead. So disabling cell walls, which bacteria need to survive, is a good way to kill bacteria without harming patients. This strategy has worked for the first antibiotic drug, penicillin (and its many derivatives), for some 75 years. Now, many strains of bacteria have evolved to resist penicillins—and other antibiotics—making the drugs less effective. According to the Centers for Disease Control and Prevention, drug-resistant strains of bacteria infect at least 2 million people, killing more than 20,000 of them in the U.S. every year. Identifying potential new drug targets, like SEDS proteins, is part of a multi-faceted approach to combating drug-resistant bacteria. If you’ve ever visited an aquarium or snorkeled along a coral reef, you’ve witnessed the dazzling colors and patterns on tropical fish. 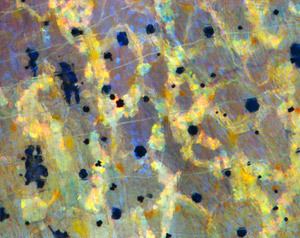 The iridescent stripes and dots come from pigment cells, which also tint skin, hair and eyes in all kinds of animals, including humans. Typically, bright colors help attract mates, while dull ones provide camouflage. In humans, pigment helps protect skin from DNA-damaging UV light. Researchers study cellular hues not only to decipher how they color our world, but also to understand skin cancers that originate from pigment cells. Some of these researchers work their way back, developmentally speaking, to focus on the type of cell, known as a neural crest cell, that is the precursor of pigment cells. Present at the earliest stages of development, neural crest cells migrate throughout an embryo and transform into many different types of cells and tissues, including nerve cells, cartilage, bone and skin. The images here, from research on neural crest cells in fish and salamanders, showcase the beauty and versatility of pigment cells in nature’s palette. 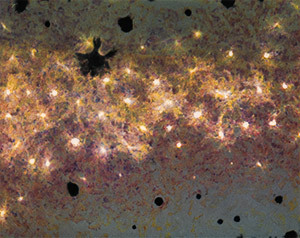 Pigment cells called xanthophores, shown here in the skin of the popular laboratory animal zebrafish, glow brightly under light. Credit: David Parichy, University of Washington. 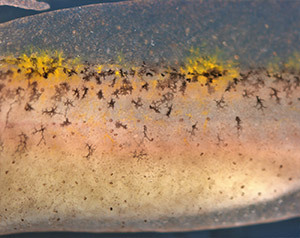 Dark pigment cells, called melanocytes, like these in pearl danio, a tropical minnow and relative of zebrafish, assemble in skin patterns that allow the animals to blend into their surroundings or attract mates. Credit: David Parichy, University of Washington. 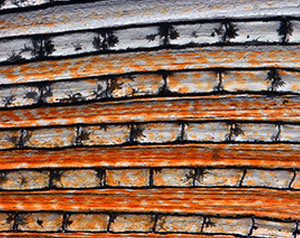 Pigment cells can form all sorts of patterns, like these stripes on the fin of pearl danio. Credit: David Parichy, University of Washington. Pigment cells arise from neural crest cells. Here, pigment cells can be seen migrating in the skin of a salamander where they will form distinct color patterns. Credit: David Parichy, University of Washington.